Namibia by car. From Etosha to the Atlantic Coast. After our visit to Etosha National Park and an overnight in Outjo, we start heading to the Atlantic Coast, via Twyfelfontein - Brandberg. 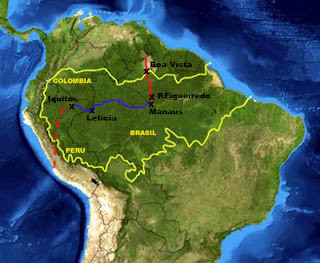 It´s around 500 km. We did this route in 3 days. The landscape changes completely No more vegetation. Here starts the amazing Namibia, beautiful and infinite landscapes. Incredible views, you won´t get bored driving from here to the southern point of the country. Around Twyfelfontein, it´s the Damaraland, semi-arid region, with small villages and cattle. Recommended route, in dry season, with a normal sedan car. The road C39 Outjo-Khorixas is tarred (130 km) and then it´s km of gravel roads: D2612 is quite bumpy and same around Twyfelfontein and on the C35 til Uis; then the road gets better when approaching the coast. With a sedan car, we drove in average at around 40 km/h (bumpy) and 60 km/h. you need more time to travel in this part of Namibia. Even if the roads are well maintened, before going, always ask the local people around. 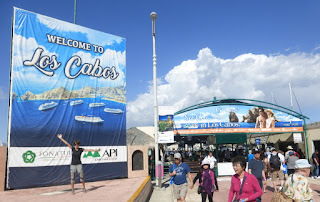 We just enjoyed the beauty of the landscape, we didn´t visit the tourist attractions (entrance fees, well signed, parkings, etc.). Price: 40 N$/pp + 20 N$/car. there are plenty of other “petrified forest” on the road. - Twyfelfontein: Price: 80 N$/pp + 20 N$/car, to see the paintings. The visit is guided and open from 8:00 til 17:00 in both places. 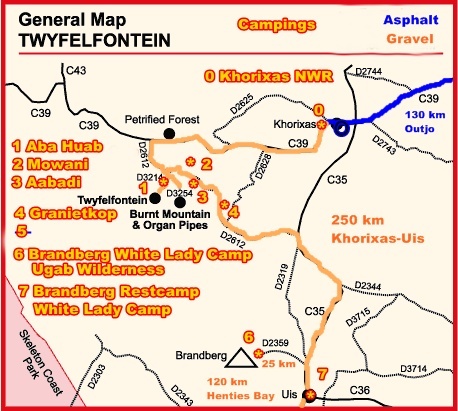 Around Twyfelfontein: Organ Pipes, Burnt Mountain, the dry river of Aba-Huab, small roads to get to the places, free, well-signed. If lucky, you can see desert elephants around (we didn´t see any! But the poo was there! ), antilopes, and ostriches. On the C35, many crafts stalls with Himba and Herrero women. A few campsites and lodges, some rustic some luxurious. New ones opening too. Aabadi Mountain Camp. Shower, toilet and views. Price for Camping is 75 N$/pp. 20 km east of Twyfelfontein (signed). Nice place, quiet, rustic and basic camp, clean. No electricity, except loundge-restaurant area. We found Aba-Huab camp (the closest to Twyfelfontein) not that cheap: 120 N$/pp +10N$/car and it´s also a basic place. Warning: Twyfelfontein and its surrounds are a natural reserve. There are signs warning that “overnight camping” is forbidden. A big granite mountain on a flat landscape, it´s the highest mountain in Namibia (above 2.500 m). The weather is dry and hot and the mountain is not easy to climb. The road D2359 brings you in 25 km to the bottom (the crossroad is 15 km north of Uis). Brandberg is famous for the “white lady”, old paintings. We didn´t go. 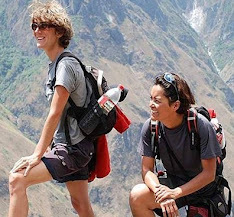 We don´t know exactly how much you have to pay for the visit (impossible to get the information in Uis), but maybe not too cheap as it seems that you can´t go without a guide and it´s one hour walk to get there. Uis has old tin mines, closed in 1990, that you can see. 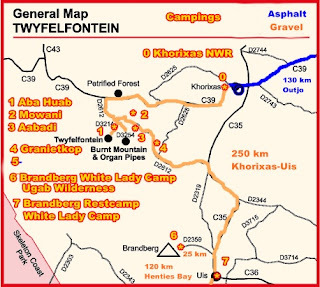 A couple of camps near (Brandberg White Lady Lodge and Ugab Wilderness Camp) and two other ones in Uis (Brandberg Restcamp and White Lady Campsite), also lodges. Similar names. Price for Camping is 100 N$/pp. Nice, clean. Free wifi and huge swimming pool. Not too many real towns. Khorixas has a gas station and a small supermarket. Same in Uis. Then only small villages with very small shops. So it´s better to get ready in Outjo or Henties Bay before you reach Damaraland. Spitzkoppe, south of Brandberg, is another conical granite mountain, smaller. Also old paintings there. It seems that you can visit the place without a guide and for free if sleeping around (another traveller told us). There´s a campsite. We didn´t go there as it was quite far (100 km south of Uis through C36&D1930 or east of Henties Bay through D1918).